Preface. Introduction. Importance of inlet conditions. Cavitation. Effects of inadequate suction conditions. The Concept of NPSH. Pressure profile along the streamline. Definition of NPSH. Practical definition of NPSH. Other qualifying criteria for NPSH. Governing Parameters. Effect of speed and capacity. Effect of pump geometry. Effect of impeller trim. Effect of pumped liquid. Effect of inlet piping. Effect of pump material. Suction Specific Speed. Safety Margins Between NPSHR and NPSHA. Practical Determination of NPSHR. Determination of NPSHA. Atmospheric pressure. Reference level. Temperature and vapour pressure. Velocity head. Measurements from Bourdon gauges. Conversion from pressure to head. Examples of Calculations of NPSHA. Pump under positive head and liquid under atmospheric pressure. Pumps under negative head and liquid under atmospheric pressure. Liquid level under positive pressure and pump below the liquid level. Liquid level under positive pressure and pump above the liquid level. Liquid level under negative pressure and pump below the liquid level. Liquid level under negative pressure and pump above the liquid level. Liquid level under the vapour pressure of the liquid. Other Phenomena. Suction recirculation. Corrosion. Submergence under a free surface. Air or gas entrainment. Dissolved gases. Conclusions. Terms, Symbols, and Units. Appendices. Cavitation, the result of insufficient pressure in a pump inlet, is not only the major cause of loss in pump performance, but also of reduced cost effectiveness. 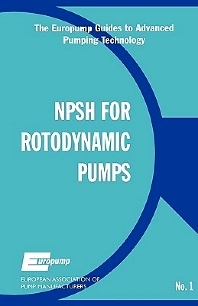 This practical guide provides straight forward, up to the minute advice on all aspects of cavitation and NPSH, enabling the end user to improve all the factors involved. Prepared by Europump - European Association of Pump Manufacturers - this book contains the results of years of research work and practical experience by leading European educational institutions and pump manufacturers to give a valuable unbiased guide which is applicable to all types of rotodynamic pumps and related systems. For engineers, scientists, educational institutions and users of pumps and pump systems.